There has been a library at the College of St George since its establishment in 1348. The Chapter Library has been added to over the centuries by members of the College and is now cared for with the College Archives. The Chapter Library contains approximately six thousand rare printed books which represent a noteworthy sequence of the major printing presses of sixteenth and seventeenth century England and Europe. The invention of the printing press in the mid-fifteenth century led to the development of an industry with a new set of techniques and craft skills. To advertise these skills to their readers, printers developed individual and easily recognisable visual trademarks known as devices. These took the form of a woodcut print which could usually be found on the title page of a book. The quirky device shown here was used by the Zurich printer Christopher Froschauer and visualises the play on words found in his surname – “Frosch” being the German word for frog. As the leading printer of the Swiss Protestant Reformation he published the first complete German vernacular Bible and, through his friendship with the Swiss Reformation leader Ulrich Zwingli, came to hold an effective monopoly on the printing of Zwingli’s writings. Froschauer was also known for the high quality of his workmanship which contained very few typesetting errors and often included decorative features. As a printer with a reputation for quality and accuracy, in addition to his monopoly on the writings of Switzerland’s leading theologian, Froschauer was a potential target for imitators and forgers. Like many other sixteenth century printers, he therefore made periodic changes to his identifying device. There are twenty five volumes printed by Christopher Froschauer in the St George’s Chapel Chapter Library; yet within this relatively small selection of his work (he published almost nine hundred works in total) there are eight different versions of his frog-based device. Some feature a fat baby riding a giant frog; one volume shows only a single frog; others, like the one shown here, feature several smaller frogs. 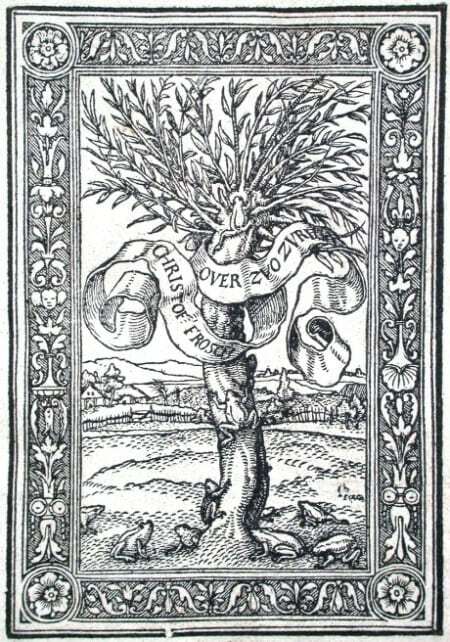 Most versions of the device also include a tree; this is likely to refer to the idea of the tree of knowledge, but may also have indicated Froschauer’s support of Protestantism and the idea of access to faith through knowledge of the written word.